After claiming a staged order, you can work the order by creating one or more related child orders from the Orders and Fills Window. Left-clicking the blue buy (B) or red sell (S) button or the Price or Order Qty cell in the row associated with the owned staged order launches your floating order entry window of choice (i.e., floating Order Pane, Order Bar, or MD Trader) seeded with the staged order details. A green plus sign displays in the upper-left-corner of the floating order entry window, indicating the owner is initiating a related child order. Tip: Right-clicking the blue buy (B) or red sell (S) button associated with the owned staged order launches the Order Pane seeded with the staged order details. Note: All Staged Orders are submitted as GTC orders regardless of the default TIF displayed in the Order Pane. Note: The child order will be rejected if the child order quantity exceeds the staged order quantity. The REJECT messages will be logged in the Audit Trail. Note: When initiating related child orders you can change the customer information associated with the staged order. Prior to X_TRADER 7.17, the Customer field displayed STAGED and was disabled. The Account # field was also disabled. 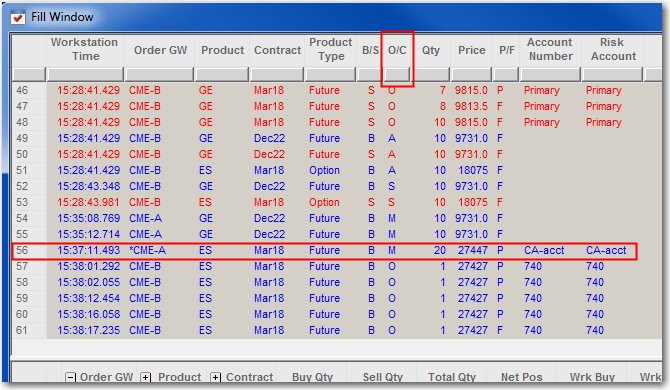 In the example floating order entry windows shown below, the staged order was a Buy order with a quantity of 500. The floating Order Pane seeded as a Buy order; notice the Sell button was disabled. The sell side was disabled in the floating MD Trader window. The order quantity of a new or modified child order cannot exceed the remaining available staged order quantity. Set your floating order entry of choice and how to activate it using the Floating Windows section on the global properties Trading tab. Activate your floating order entry by clicking the Buy button or Sell button in the staged order row. Use the floating order entry to create and submit your order. Owners may create one or more related child orders. In turn, these child orders may send multiple sub-orders (e.g., Time Sliced orders). Orders are grouped together by their parent/child relationships with child orders located directly below its parent order. Child orders are assigned a key which is displayed in the Parent Key column. This key is the parent order’s TT Order Key, a unique key that does not change during the life of the parent order. Use the Parent Key column to quickly filter all related child orders. The Orders Pane displays the staged order and related child orders. Orders are grouped together by their parent/child relationships with child orders located directly below its parent order. Child orders are assigned a key which is displayed in the Parent Key column. This key is the parent order’s TT Order Key, a unique key that does not change during the life of the parent order. Use the Parent Key column to quickly filter all related child orders. In the example shown below, the Working child order displays the TT Order Key assigned to the parent order in the Parent Key column. There is also one filled child order. 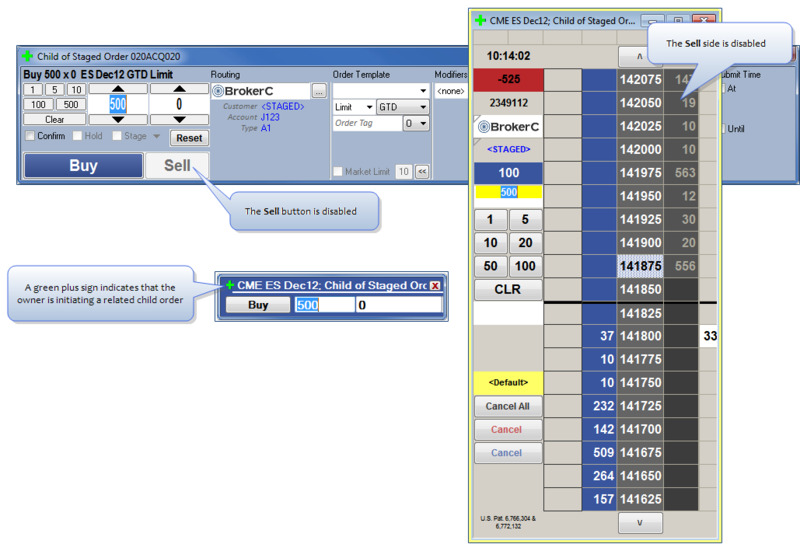 Staged Manual Fills are available for child orders of a claimed Staged Order and can be selected from the Order Template dropdown of the MD Trader® and Order Pane. When applying a Staged Manual Fill, a confirmation window is invoked prior to submission. In the Order Book, the Exec Qty column will update to reflect the manually filled quantity for the claimed staged order. The Staged Manual Fill is displayed in the Fills Pane of the Orders and Fills Window and Fill Window and is designated by an "M" in the O/C column.